So, because I have now more time again, I can also post my crafty stuffs again. Basically I made a monkey adapted from this site (which is not really more important), where the logo appears to be a monkey drawn in some very basic computer programme like paint or something. I used an adapted pattern and leftover yarn in appropriate colours, so it’s easy to reproduce. 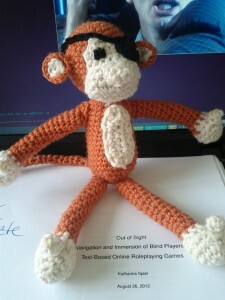 The eyepatch is done by crocheting a circle of two rows (6 and 12 stitches, you probably know the drill and if not, check out one of my other patterns.) and a crocheted chain of appropriate length which is then sewn onto the monkey. I embroidered the other eye. The monkey is of course sitting on a proof reading version of my thesis, which was appropriate at the time, but I only came to posting about it now.